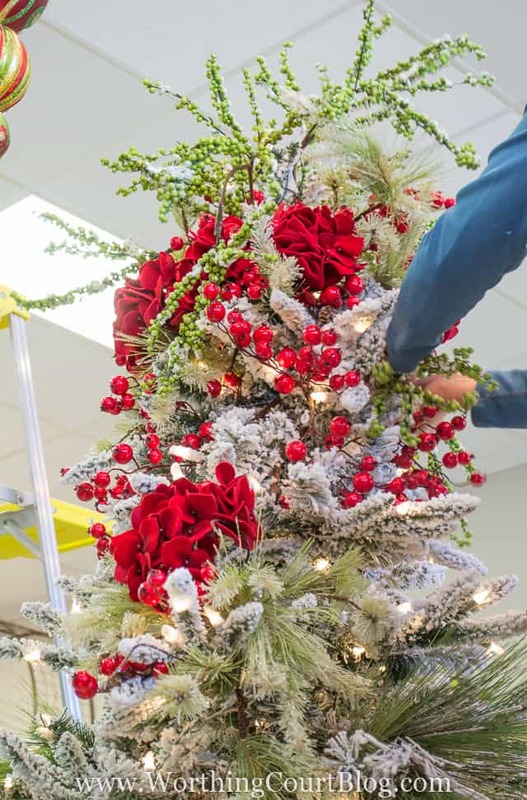 So far the pros at Total Bliss have shown us step-by-step directions and secrets for Decorating A Christmas Tree and Decorating A Christmas Wreath. We’re going back today so that the owner, Nancy, can show us how to decorate a gorgeous Christmas garland. 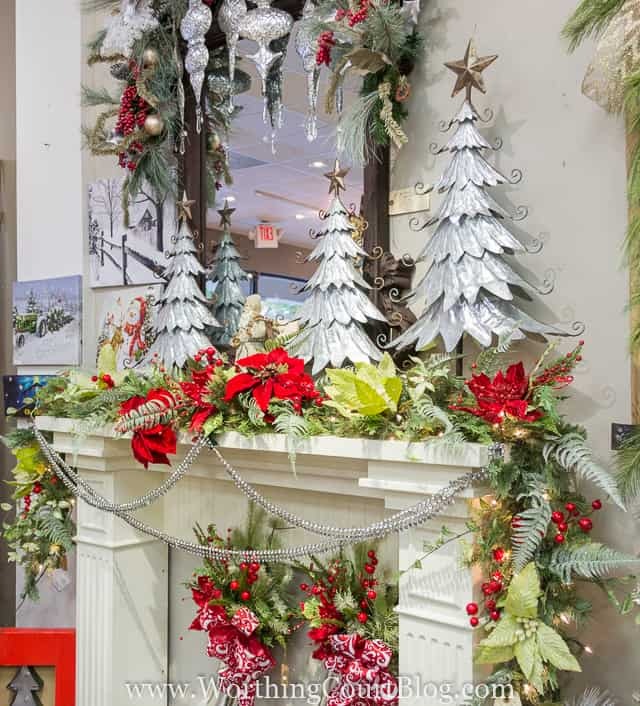 This is the finished garland placed on the faux fireplace in the shop. It has been further embellished with gorgeous silver trees and dangly crystal beads. But it didn’t always look like this. 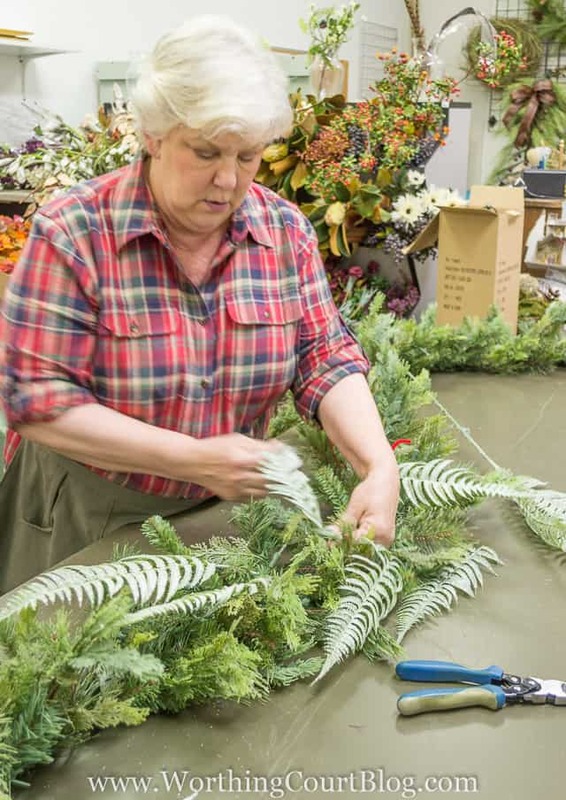 Just like a faux Christmas tree, a garland needs to be fluffed before getting started. If your garland has lights, be sure to test those before decorating too. 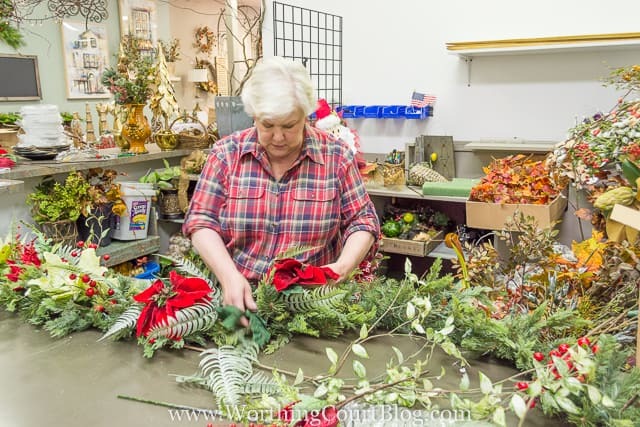 Nancy recommends decorating one half of the garland at a time, beginning in the middle and working your way toward the end. That way you get a better idea of how it’s going to look before you spend time decorating the whole thing. 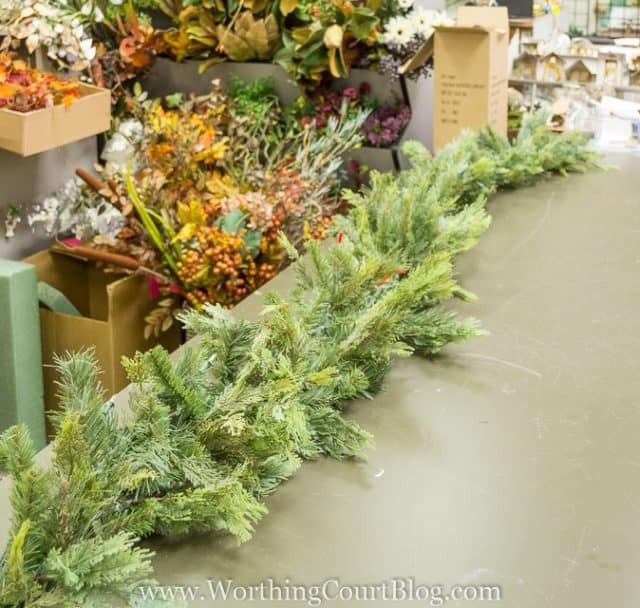 Depending on what you’re going to decorate your garland with, supplies you may need are cable ties, green floral wire, pipe cleaners, wire snips, scissors and a hot glue gun and glue sticks. But believe it or not, you won’t need any of these unless the decorations you’re using are heavy or might possibly fall off and break. 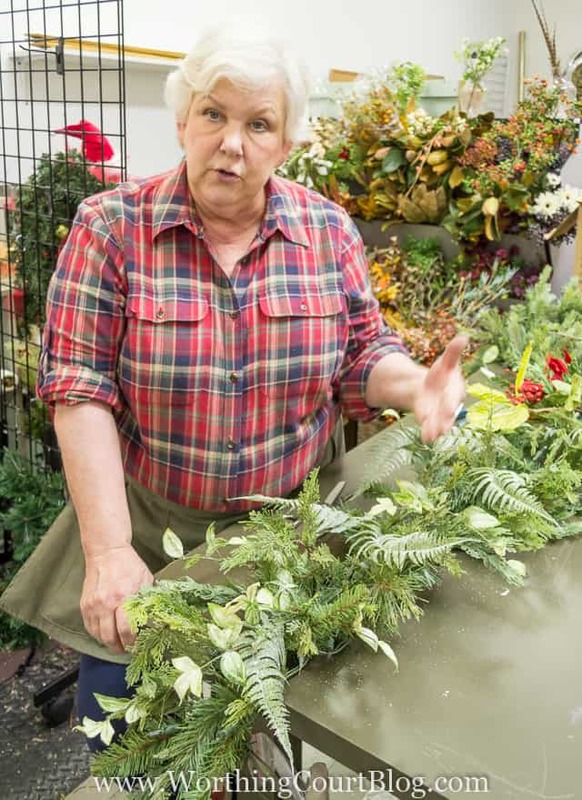 Nancy recommends color coordinating the garland with the other Christmas decor that is in the same area. Find the center of the garland and mark with a piece of ribbon or something else. 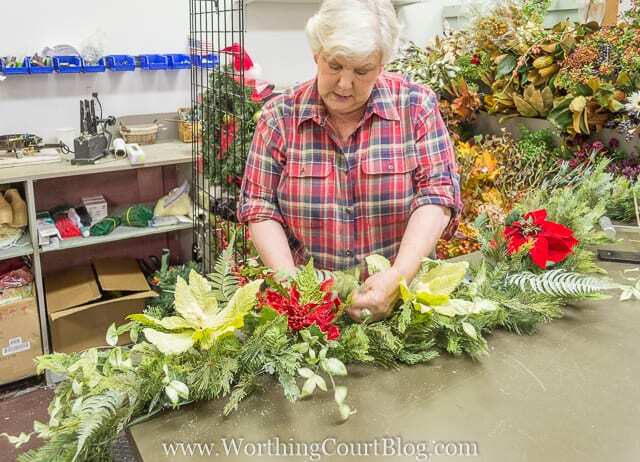 It’s best to add dimension to a garland with the addition of stems and picks. 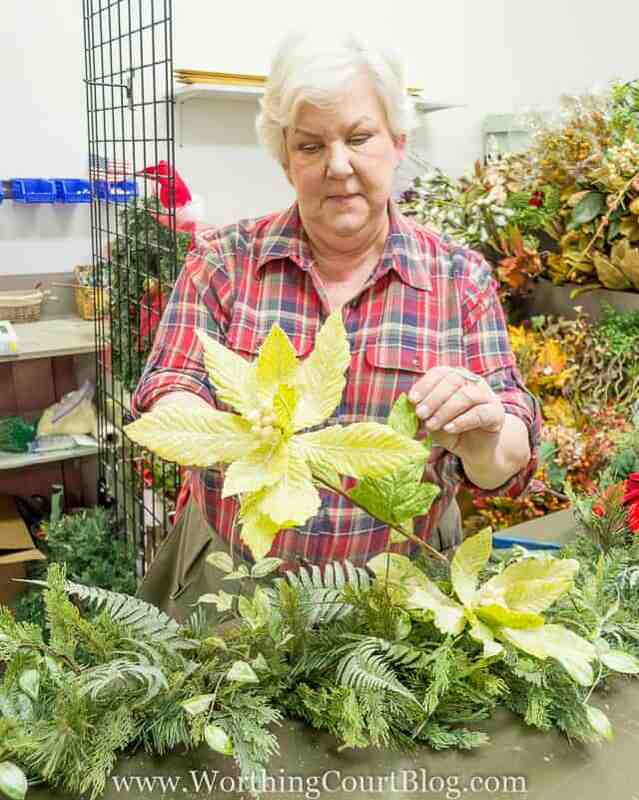 Start with something leafy or twiggy before adding large flowers. You can cut them apart to make them go farther. Fluff them, bend them, shape them. Make them look natural. And then tuck them into the garland. No need to use anything to hold them in place, unless they’re heavy. You don’t need to use all the same type of stems. Add variety by using one or more types. 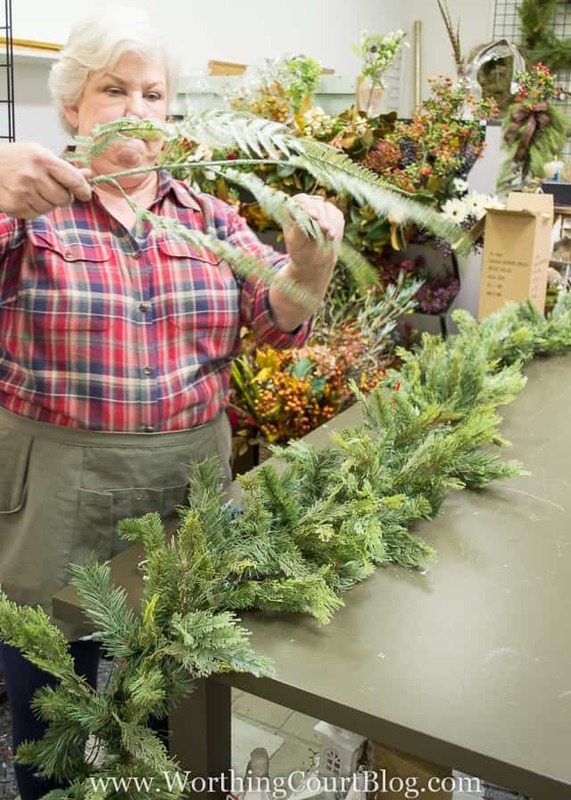 Taper off the amount of stems and other decorations the closer that you get to the tip of the garland. Now is the time to work in larger elements, such as flowers. Just like with the stems – add a variety. They don’t all have to be the same. Wiring multiple picks together will make more of a statement. 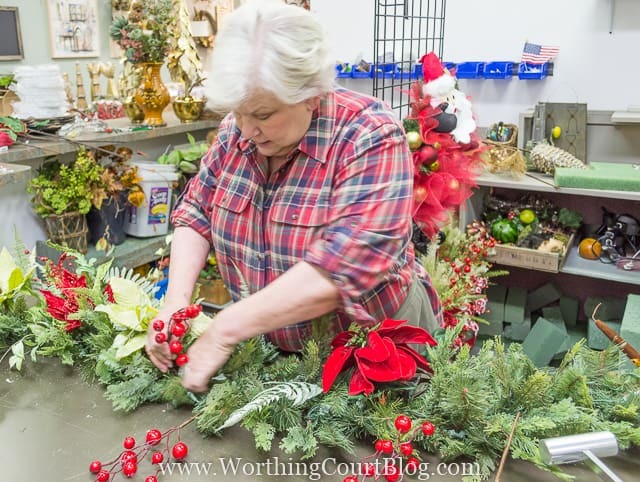 Below, Nancy has grouped together a large poinsettia, a leafy pick and berry pick. 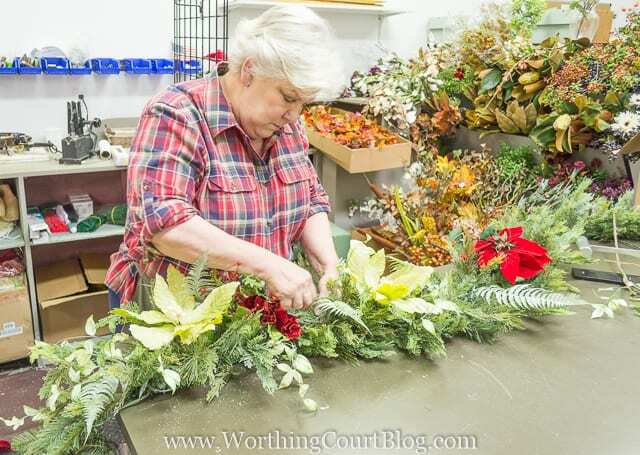 Continue tucking the larger elements into the garland, remembering to taper them off toward the ends. The garland really started coming to life with the addition of large red berries. 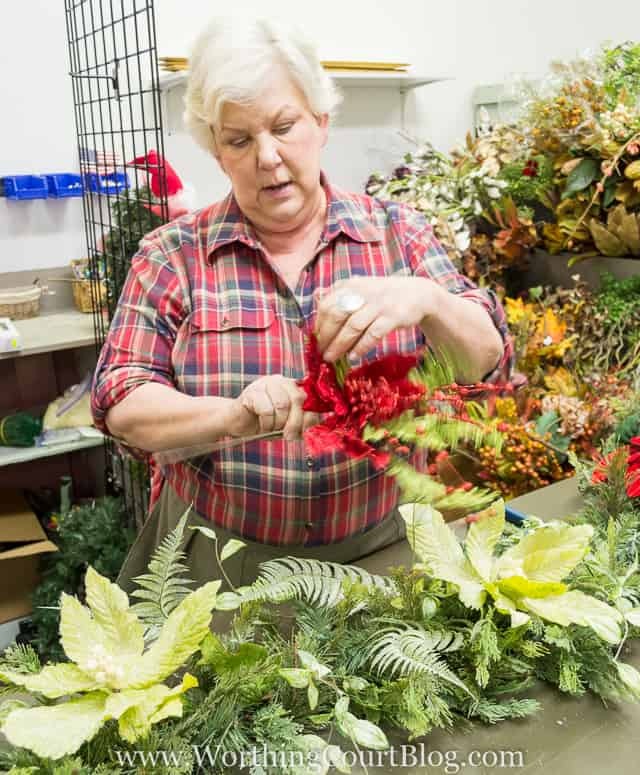 They started out as one large bunch, but Nancy cut them apart before tucking them into the garland. Sometimes, you see a bow placed in the center of a garland. 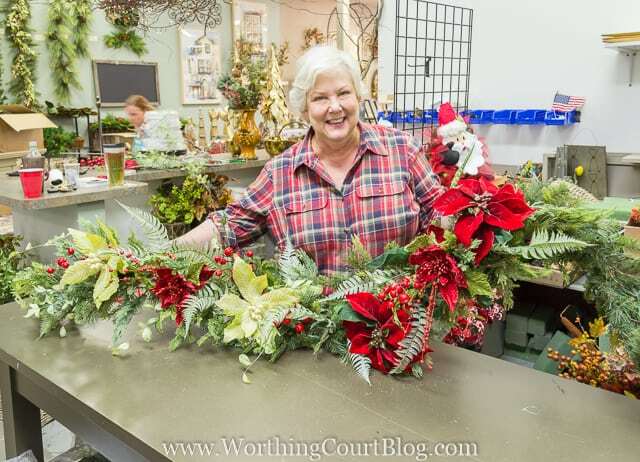 But Nancy used a grouping of large poinsettias, fern leaves and berries as the focal point for this garland. Beautiful, Nancy! And so is the garland! Repeat the decorations on the other end of the garland and you’re done! If you enjoyed these tips from the pros at Total Bliss, you won’t want to miss these tutorials. thanks for sharing that with us Suzy. I learned a lot about what to do Next year… I spend this coming year looking for the different elements I’ll need. 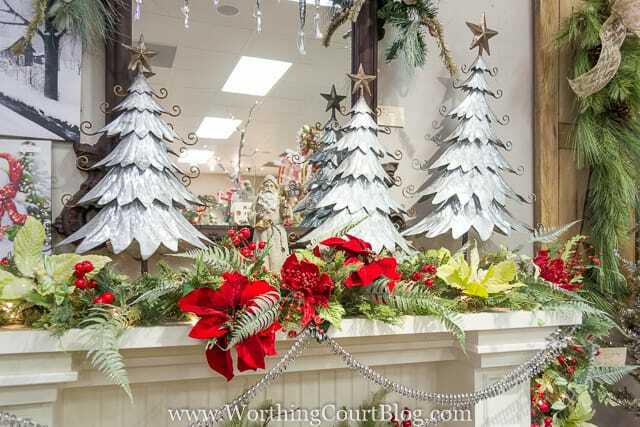 that whole set up is just beautiful – the wreath is gorgeous, but the silver christmas trees and ornaments just enhance the whole thing – it’s easy to see that you have an excellent eye for home decor! Thank you for sharing so many decorating and designer tips. 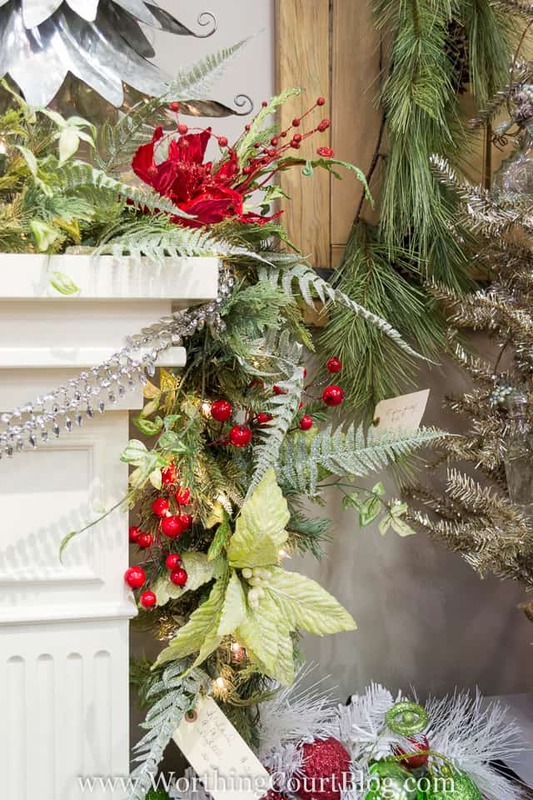 Everything in Total Bliss is absolutely gorgeous, and this year’s Open House had me wondering about decorating garland! Now I have a step by step! I can’t wait to see your decorations this year! 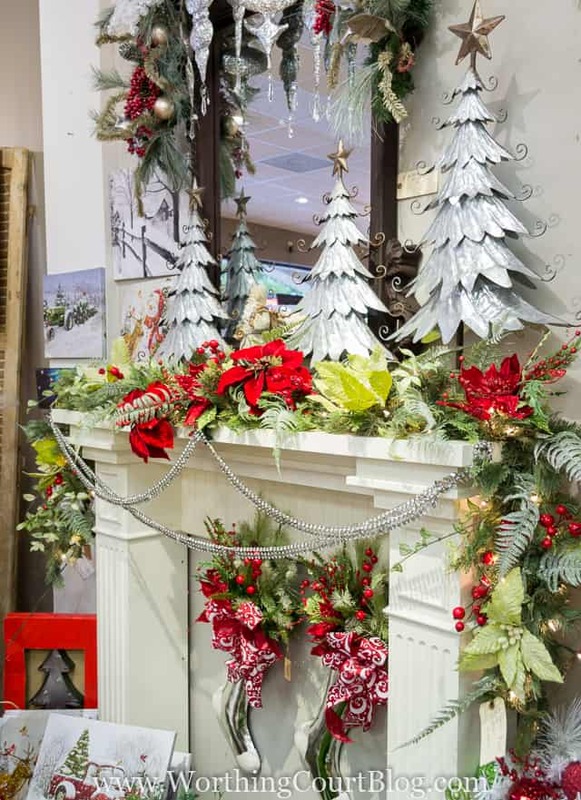 How do you successfully attach a garland to the top and sides of a mantle? Hi Virginia. Most of the time, my garland is just lying across the top of the mantel, without anything holding it place. However, if I want to hang something from the front of the mantel, I’ll use Command Strips, if it’s lightweight enough. For heavier garlands I’ve used either tacks or small nails to hold the garland and then come back later to patch and paint (or touch up with stain).